A natural, vegan soap. Made with gluten free oat milk, organic oils and a soothing essential oil blend. This soap was made with sensitive skin in mind. 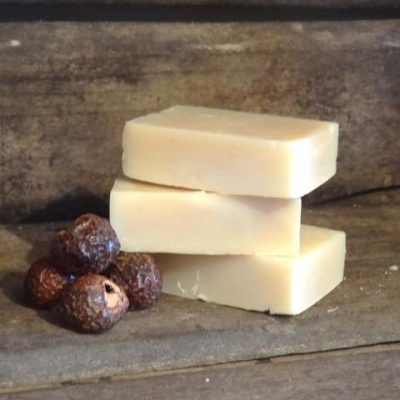 Made with gluten free oat milk, organic oils and a soothing essential oil blend, this soap is perfect for skin that may need a little bit of TLC. Plastic free and Palm Oil free. Certified vegan. Comes packed in a biodegradable muslin bag. Free from SLS's, Parabens, Phthalates, Synthetic fragrances, Palm Oil and Synthetic additives. + OAT MILK has been used for centuries on eczema prone skin because of its soothing and anti-inflammatory properties. We hand-blend our own gluten free oat milk so that allergy sufferers can benefit also. + ORGANIC CALENDULA OIL is a great gentle antiseptic, also anti-inflammatory and aids in the regeneration of healthy skin. + ORGANIC APRICOT KERNEL OIL deeply nourishes and is packed full of helpful anti-oxidants. + PURE ESSENTIAL OIL BLEND with Cedarwood Oil which is has great anti-inflammatory properties as well as being great at controlling oil production and fighting germs. And Patchouli Oil because it's great at healing skin, anti-inflammatory, and helps skin regenerate. NGREDIENTS: Organic Cocos Nucifera (coconut) oil, Olea Europaea (olive) fruit oil, Organic Prunus Amygdalus Dulcis (almond) oil, Organic Sapindus Mukorossi (soapnut) fruit extract, Aveena Sativa (oat) milk (gluten free), Organic Butyrospermum Parkii (shea butter), Organic Prunus Armeniaca (apricot) kernel oil, Calendula Officinalis (calendula) flower extract, Sodium hydroxide*, Thuja Orientalis (cedarwood) leaf oil, Pogostemon Cablin (patchouli) leaf oil, Geraniol**, Citronellol**, Linalool**, Limonene**. *After the saponification process no sodium hydroxide remains. **Occurs naturally in essential oils.